Large forces and 6 planes fight Biriya Forest blaze, near grave of Targum Yonatan author, as crews and helicopter keep fire from moshav. 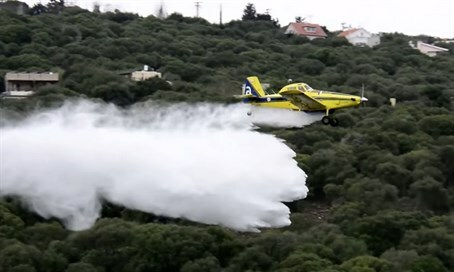 Large firefighting forces were dispatched on Monday to put out a blaze in Biriya Forest, located to the north of the Kinneret (Sea of Galilee), even as other crews fought a fire on the coastal plains. The forest fire broke out a short distance from the grave of Rabbi Yonatan Ben Uziel, one of the tannaim who studied under Hillel the Elder, and the author of Targum Yonatan. Six firefighting planes were dispatched to help control the fire at Biriya Forest, and police evacuated hikers from the area. There have been no reports of anyone being wounded or trapped by the blaze. Police closed the traffic routes in the area to keep drivers safe. In a second fire front, six firefighting crews were dispatched to try and control a large fire that broke out in a grove of trees adjacent to Highway 3, near the moshav Yesodot located to the east of Ashdod. The firefighters fought to prevent the blaze from spreading towards the homes in the moshav. A firefighting helicopter was also dispatched to help the crews, and police forces were also sent to the area. Car traffic was stopped in the region due to the danger from the flames, and hikers who were walking in the area were evacuated.